Jumps Racing… Time to stop the slaughter. As a self-confessed sports-nut and someone who is obsessed with winning, I’m happy to watch two individuals, animals or machines oppose each other in almost anything you could think of. However, there comes a point in time when I say enough is enough. That point is usually reached when people, or animals, are getting hurt. Over the past few years, every time May rolls around on the annual calender you can bet your bottom dollar that within a day or two, the headlines are flooded with news reports about another innocent horse losing its life, or being seriously injured after a fall at Warrnambool. Sure enough, this year is no exception as two horses died in recent weeks, sparking more calls for the brutal, barbaric sport to be stopped immediately. In addition to this, the horses riders were also injured as both ended up in hospital with brain injuries of varying severity. Despite this, the races continued today at Warrnambool and once again sports fans and animal lovers alike were left calling for an immediate end to the so-called, “Sport of Kings”. After viewing the footage, it’s obvious that the stress which the horses are placed under is extreme and despite hours upon hours of training, the whip and hurdles to jump are simply not natural for the horses. It’s easy to see why they bolt. Just last year, Racing Victoria chief, Rob Hines, went on record and said that, “Jumps Racing was no more gruesome than Ultimate Fighting (UFC)”… Here in lies the problem. The two sports simply can not be compared due to the fundamental fact that humans have a choice and make a conscious decision to enter a ring, knowing full-well they are likely to get the daylights punched out of them, whilst these innocent horses have no say in the matter. The public also believe that the sport must end with recent statistics gathered by polling company AusPolls, showing that 65 per cent of Victorians believed that deaths and injuries to horses were not an acceptable price to pay for the continuation of jumps racing. 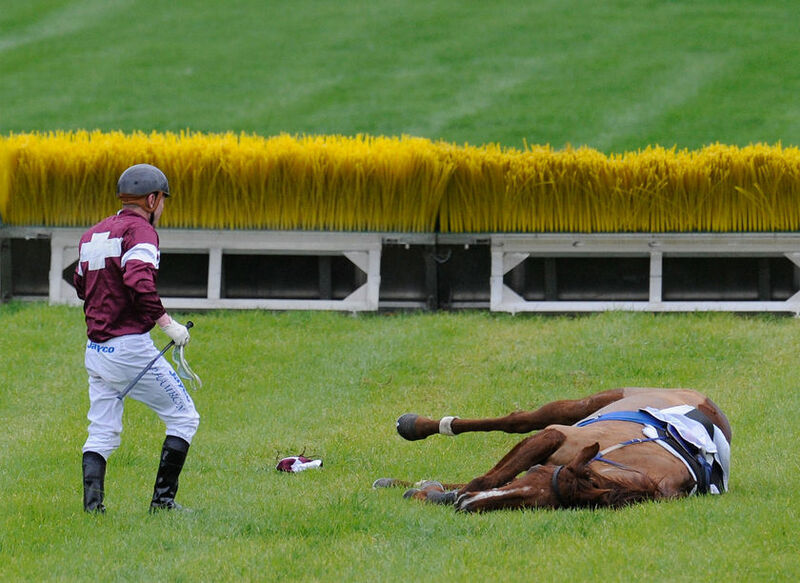 In total, a staggering 39 horses have lost their lives since 2007 at Victorian jump racing meets and since 2001, there have been 3 separate reviews into jumps racing (2001, 2005 and 2008). Each review has seen several safety changes implemented which have made little or no difference to the fall and fatality rate. It appears that the real purpose of these reviews is to buy some time in a vain hope that either the deaths and falls will reduce to what they consider an acceptable level or to wear down the jumps racing opponents. My question to you, our subscribers is, if this many dogs were being killed as a result of activities such as this, would the reaction from the government be different? My guess is that it most certainly would be. It’s time Victoria follows the lead of the rest of Australia (minus South Australia) and makes jump racing an illegal activity where offenders either end up heavily fined or even in jail. It’s the only way to ensure no more innocent horses are killed in such a barbaric, gruesome fashion.